The previous day had passed uneventfully. We spent most of our time eating and playing cards, but the wind that howled that day brought with it something unexpected – smoke. We learned from the local fireman/hunter/teacher that there was a blaze in the pass we were due to walk in a couple of days time. The mountains were obscurred, it was obviously quite some fire. Still, it gave us a well earned rest in the full knowledge that the wind would make packrafting impossible. The wind dropped off overnight and we slept well. I was up early to shoot a time-lapse of Aapilatoq and the two peaks behind. Whilst my original intention for my film had been to show wilderness free from man, I now felt a certain fondness to this remote village. Sadly when I returned to collect my camera I found that it had been misfiring – the camera wire had a dodgy connection and was now unusable. Disappointed to have missed the shot and knowing that I would now have to make do with the inbuilt camera feature to shoot timelapse (creating sync problems with my slider) I was in a bit of a mood that morning. It didn’t improve. 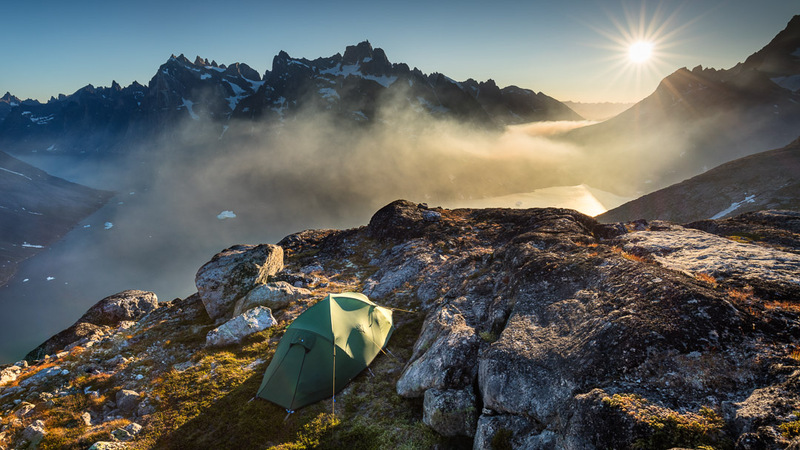 Sun rise on the twin peaks above Aappillatoq. Whilst loading my packraft with a few last items it rolled upside down. 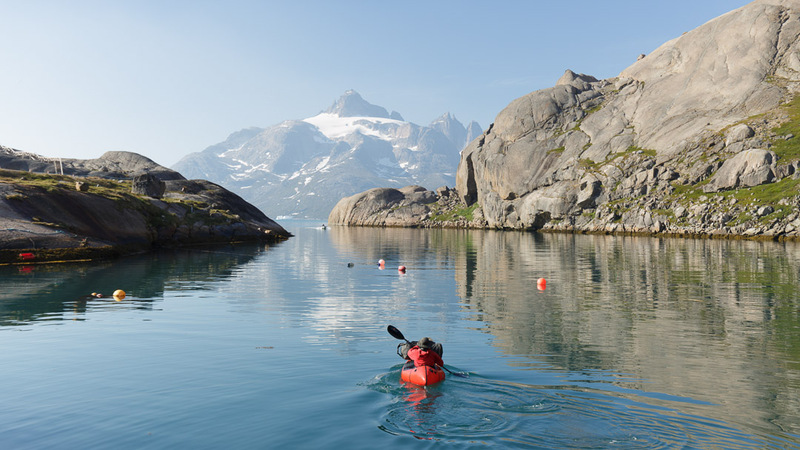 My Canon 6D, sat on the deck ready to shoot images of us packrafting, took a short dunk into the saltwater. Though was only submerged for a second it was enough to write off the camera and lens. I was now down to a single camera. A few seal hunters looked on bemused, no doubt wondering what we were doing in such ridiculous boats. We headed out onto the water with a thin veil of smoke in the air. The fire that started the day before was still burning further down the fjord. As we rounded the corner of the natural bay and headed into open water the wind and waves began to gather strength. We picked a route between icebergs to find some shelter but more we paddled the harder it became. These waves were different to the ones I had enjoyed paddling through earlier in the trip. The water was choppier and the waves started to hit our boats progressively harder. Packing up, then hesitating. We didnt want to walk up from this point but the map showed vertical cliffs just around the corner. We came ashore just before a section of vertical cliffs, attempting to round them was too committing. Our plan for the day was to reach a peak diagonally above us via an easy approach further down the fjord. At the bottom we could leave our rafts and extra food and come back to collect them the following day. However with no easy way around the cliff we were forced into taking everything with us up a much steeper approach. The first 200m of the climb passed without incident but as we ascended so the slope became increasingly challenging. Soon we were hiking on steep granite slabs which called more for climbing shoes than clumsy hiking boots. A half slip was all it took to shatter my confidence, Harsharn wasn’t enjoying it either. A steeper route than it looks! We sat on the mountainside and contemplated our next move. Harsharn was the first to say something. He wanted to head back to Aapilatoq. The slope concerned him and he suspected it would soon become impossible. More pressingly he felt that the fire in the pass, which we had to walk through in the following days, would simply be too dangerous. 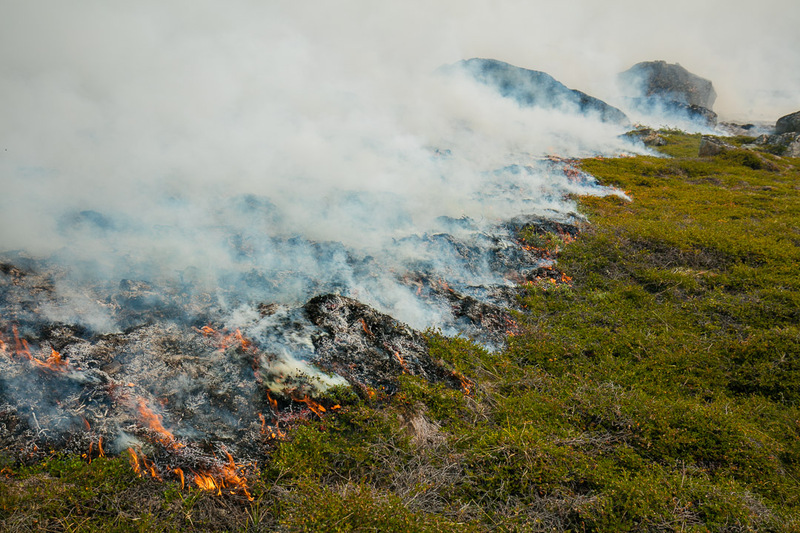 I scoffed a little – the idea of a wildfire blazing so fiercely that a wide treeless valley could not be crossed was slightly ridiculous to me. Nevertheless I didn’t feel I had the ability to go further up the slabs – a mistake would have been fatal. Reality started to sink in and a sense of despair washed over me. I was within a mile of a place I had dreamt of visiting but we were turning back. Trip over. I started to feel sick. We had come all this way! 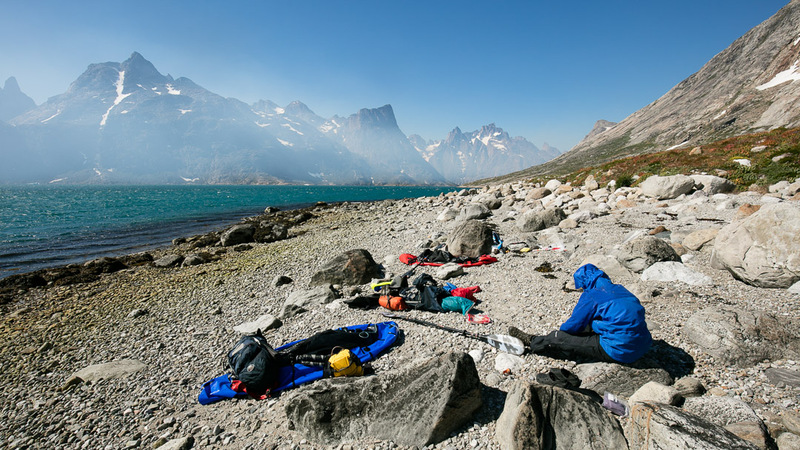 A low point of the trip – I was completely gutted that we would have to turn around. I dropped my pack and ran up the slabs 50m or so. If we were going back I was going to make sure there was no other choice! As I climbed I found a break in the slabs just six inches wide but filled with grass and gravel. 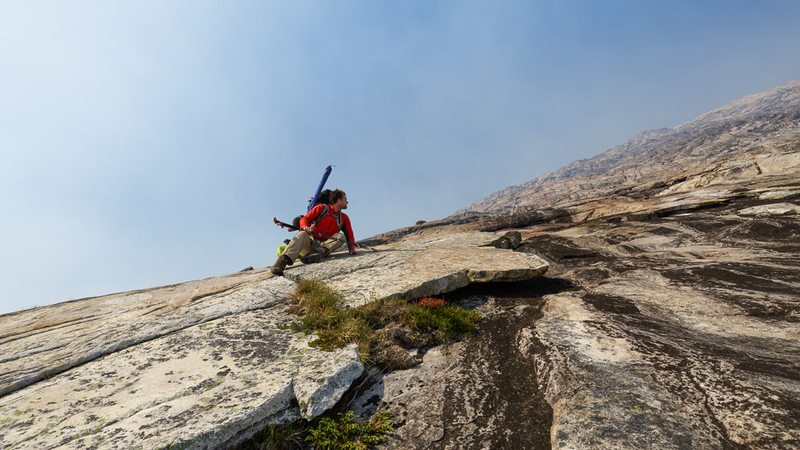 It was a near perfect diagonal line leading straight up the granite face – I couldn’t believe my luck! We didn’t hesitate in putting our packs back on and following the new lead. 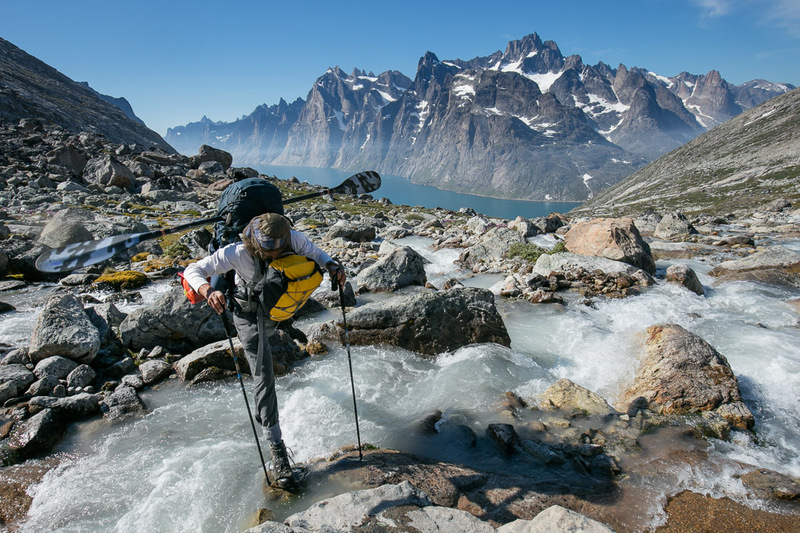 We made confident progress, struggling under the weight of our packs but increasingly optimistic that we would reach our goal, a 650m peak above the fjord. With a final scramble over a tower of rock a vast scene revealed itself. 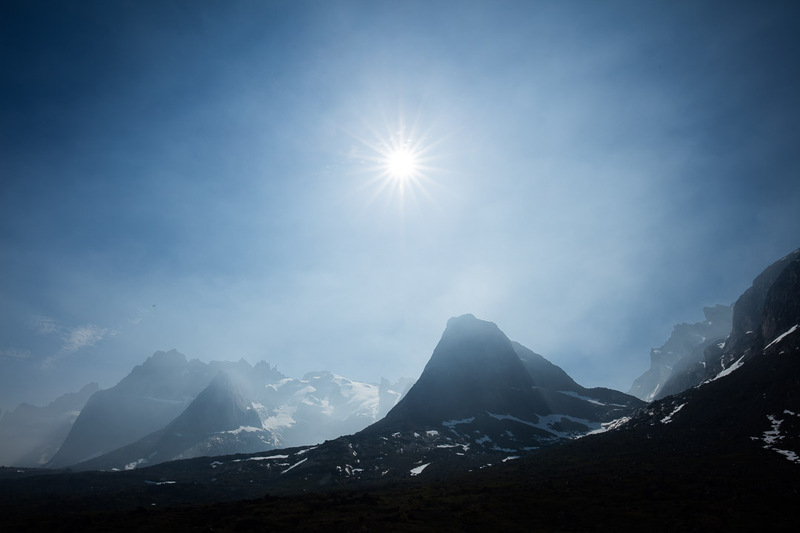 Even with the smoke trying to spoil the view it was a sight to behold – vast granite faces shot up vertically up from the fjord below and behind them ice capped mountains and jagged ridges. A quick search revealed a sheltered camp spot, which was just as well given then strength of the wind. I felt an enormous sense of achievement! 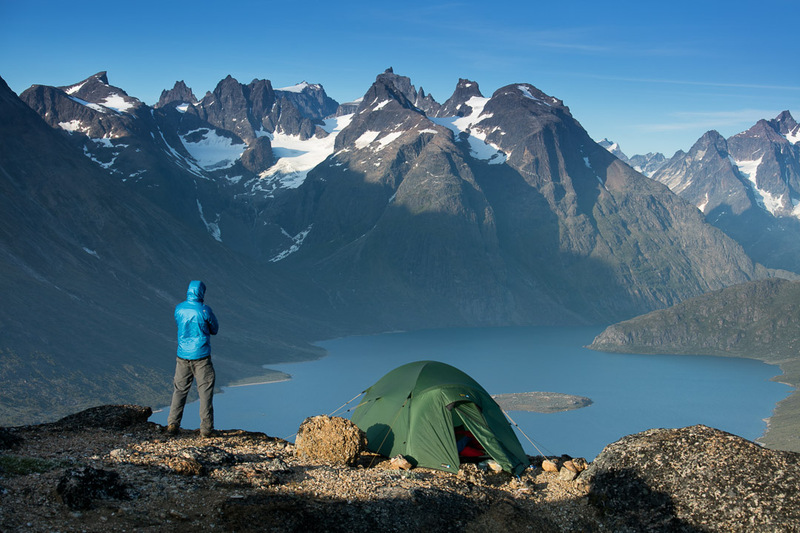 Our tent 600m above Aappilattup Avanna fjord. Not too shabby. By the following morning the wind had gone and the air was clear revealing the view in greater clarity. As I packed away my tripod a leg fell off – the casting had broken. I now had a largely useless bipod – wonderful! Including my camera and lens I was now hauling 3.5kg of dead weight. On route down to the fjord. The route of our descent (which had scared me a little in the wind the night before) looked easy enough in the sunshine. We picked a route down steep scree slopes, over old snow, across a river and down grassy banks. Before we knew it we were back at the water’s edge with inflated packrafts and only a short distance to paddle. The shortest paddle of the trip over to the shore on the right. Once ashore again we felt energetic enough to carry on along the pass, somewhat curious to see the source of the smoke which for the time being seemed to have died down. Initially it seemed like we had an easy path to hike along (the first of the trip) but we soon lost it and instead made our way across ankle twisting tundra. By the end of the day I was totally exhausted and glad to see the lake come into view which was our planned camp spot. Our camp, a load of smoke and the ever present mosquitos! 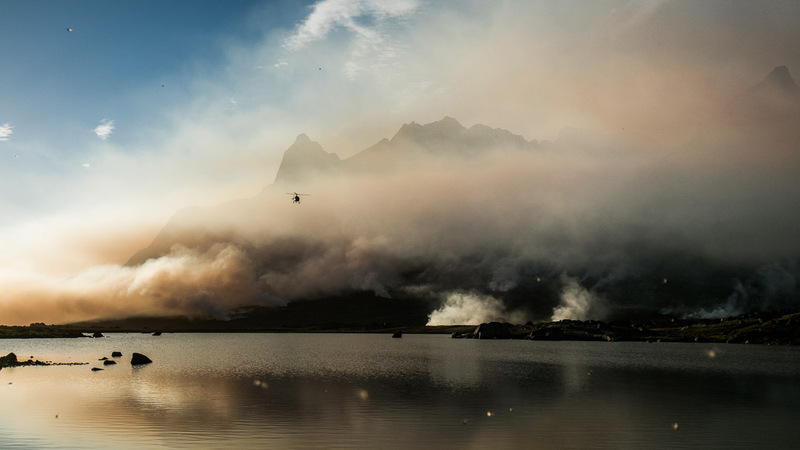 A helicopter transporting fire fighters (and more mosquitos). 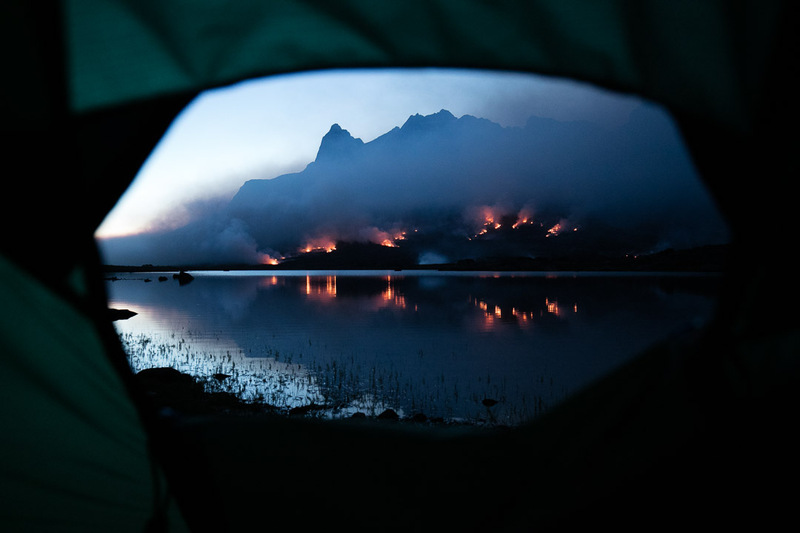 From camp we could see the source of the smoke very clearly – a fire burned on the valley side not far away. 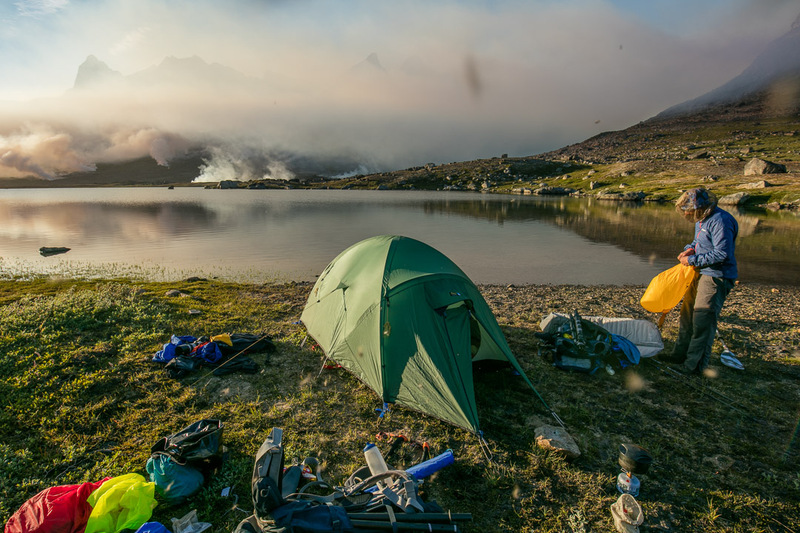 It was with some regret that we camped in the smoke that night. Our equipment and clothes smelt for a long time after. 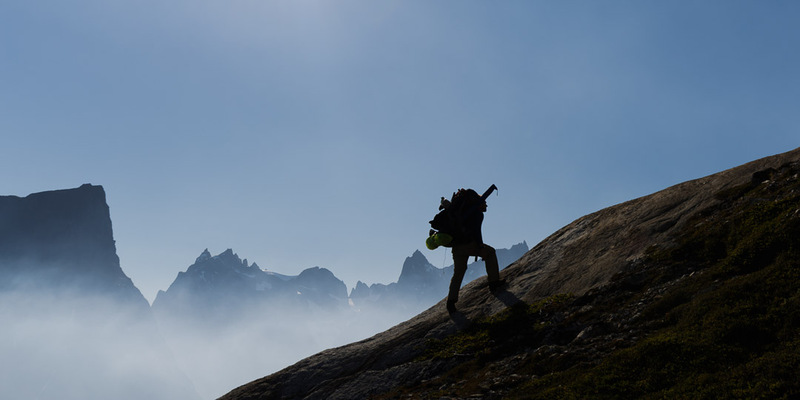 The following morning we carried on over the pass and near to the fire’s edge. I had previously assumed that the wind would blow fires downwind. Instead we saw the wind fanning the flames, creating an intense heat which dried out the greenery in front before it, in turn, spontaneously burst into flames. So the fire advanced into the wind. It was quite a sight to behold and the heat on close approach was astonishing to me. One of many fronts of the fire. Although it looks quite tame it was advancing rapidly and generating a lot of heat. Our hike continued on uneventfully and, as we left the best scenery behind, I took very few photos. Sight of the opposite side of the fjord at the end of the valley gave us initial encouragement before we realised how far we still had to go! 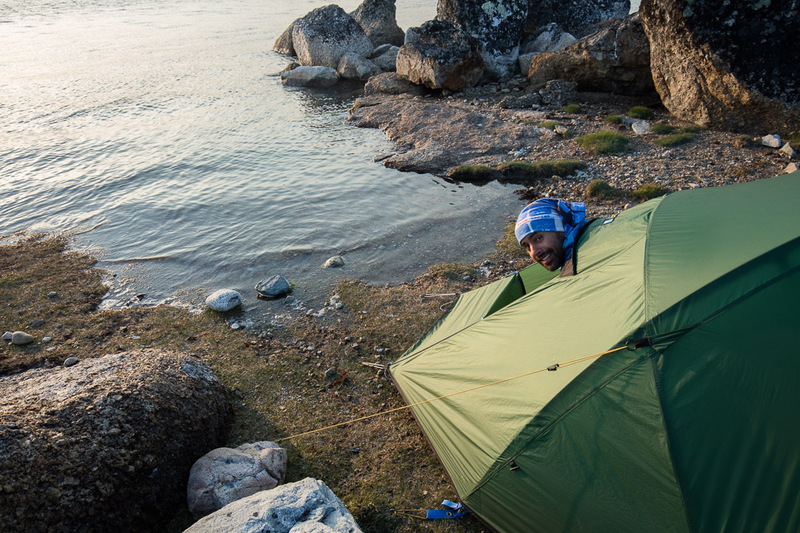 We made camp right on the tide line and laughed as the sea came up a little further than expected! We fished a lot that evening but caught nothing big enough to eat. 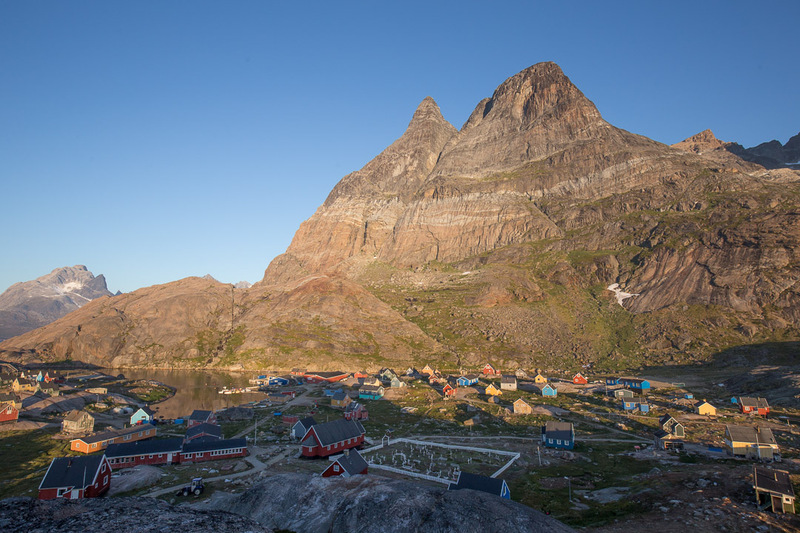 Our penultimate day in Tasermiut was totally unplanned. We had arrived 2 days ahead of schedule (the smoke had hurried us along) and it made no sense to relax. Instead we paddled across the bay towards Malik our boat drivers farm, finding it empty. and then along a hill and up a ridge. We stashed most of our kit below and ate up the small mountain like it was hardly there. Along the way I collected berries which ended up in my porridge the following morning. 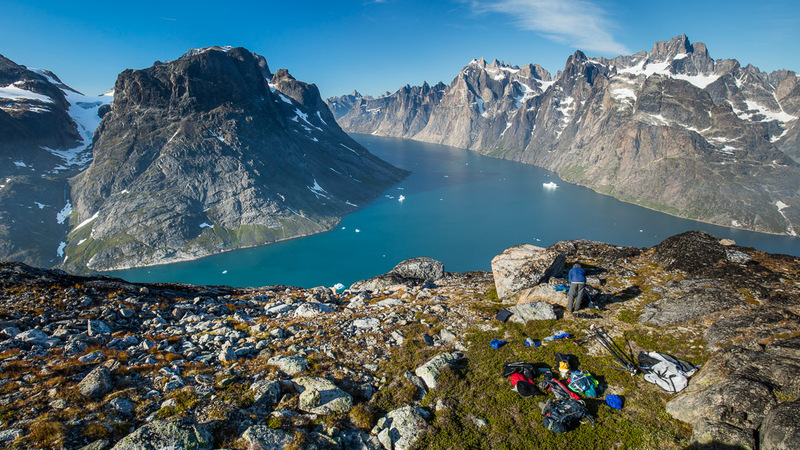 It was apt that from our final camp spot we could see down Tasermiut fjord to where our adventure had began and along Tasersuaq lake to where it had continued. 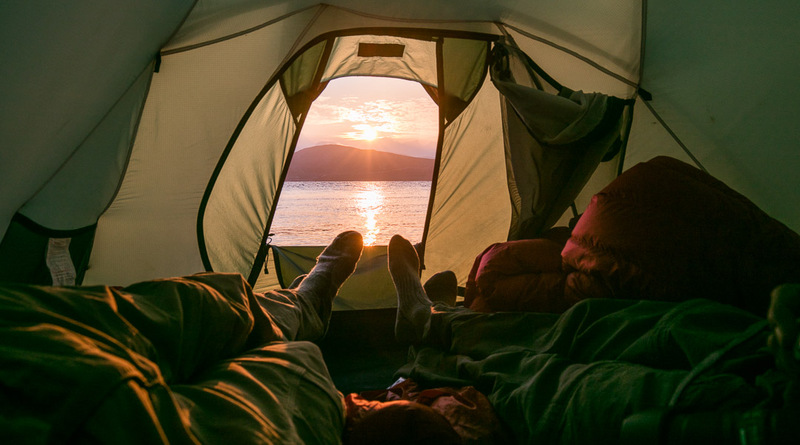 It seemed like and age ago that we had started and as we looked out on this last remarkable view our thoughts finally turned to home and a good rest. Tasersuaq Lake which we paddled down a week before is teaming with fish. The section of river you see flowing from it is a popular fishing spot for locals. Written by alexnail, posted on 4th January 2017 at 6:39 pm, in Trip Reports. Permalink. RSS feed for this post. Nice, enjoyed your trip with you. I spend my summers in Ilulissat sailing in the Disco Bay. What a wonderful adventure, snafus and all. It’s noteworthy that you ended up full of energy. I agree that the shots with something going on other than pure landscape make more impact (like the kids on the swing or the town at the foot of the twin peaks). With hindsight can you think of ways you could have reduced weight still more? I’d probably take a sturdy table top tripod. The low profile helps with wind and you can often find a rock to put it on. I don’t think it would have been possible to reduce weight in any meaningful way with bringing less food! The Ultra Quasar tent at 3.1kg shared is probably the most heavyweight item, but the extra security is fantastic and they are rather good looking tents to photograph. I might also have taken less camera gear, but I used it all, needed 2 cameras in the end and the time-lapse film I produced probably remains my crowning achievement so far! The problem with incorporating people in the landscape is two fold, firstly if you include a person they become the focal point of the image, secondly it can be hard to find a suitable model on a trip like this! I do agree that variety is good though and I hope to shoot more ‘action shots’ in future. It looks like an epic adventure. I enjoyed the reading as well as the photo’s. It is such a beautiful place. If I may ask, what packrafts did you use? Would you recommend using that brand? I have a trip in mind that requires rafts, but for some distances one should be able to carry them as well. Thanks! 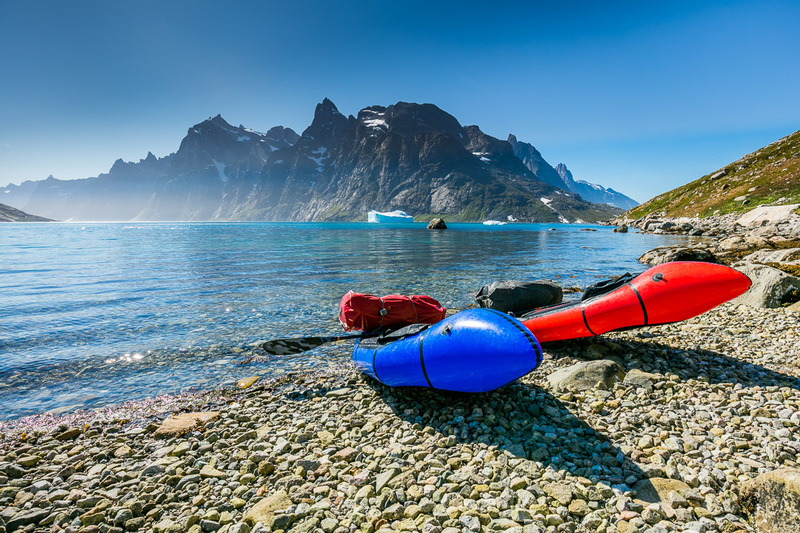 We used Alpacka Packrafts. I think they are the gold standard by which other companies are measured. They were excellent and a lot of fun. Wow, great story, great adventure and amazing shots of this beautiful scenery, Alex.